Sash opens to 90 degrees, allowing access from interior for ease of cleaning. 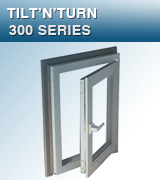 Tight and water sealed with compression lock against durable, double weatherseals. Excellent hardware locking system and profile design, resulting in F-2 security rating from CSA.